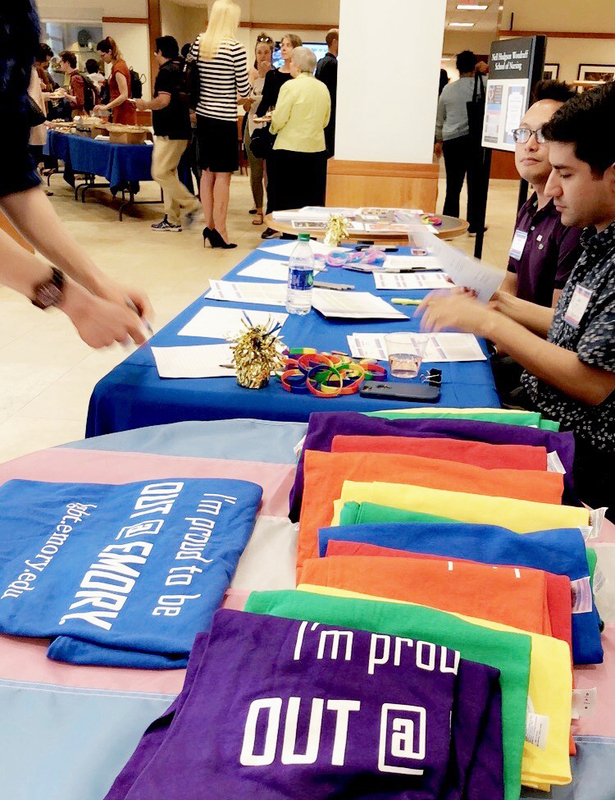 This past week, the Dean’s Executive Student Council (DESC) and SpeakOUT, a new LGBT student advocacy group, hosted the first transgender health training at Nell Hodgson Woodruff School of Nursing (NHWSN). 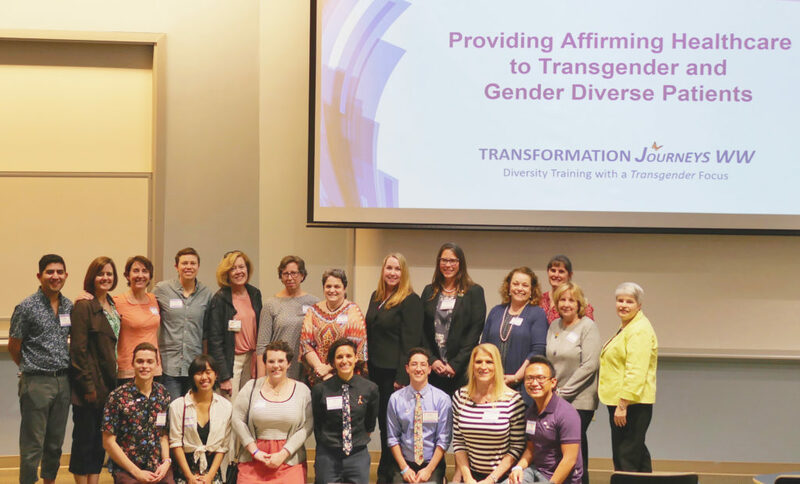 The presentation was entitled “Providing Affirming Healthcare to Transgender and Gender Diverse Patients” and while it was hosted at NHWSN, this event wouldn’t have been possible without the collective teamwork of Emory School of Medicine and Allied Health Professions, Laney Graduate School and the Office of LGBT Life. Additionally, we were privileged to welcome co-founders Linda Herzer and Gabrielle Claiborne from Atlanta-based diversity training firm, Transformation Journeys Worldwide and family nurse practitioner, Michelle Sariev to share their expertise about the health needs of gender minorities. Michelle’s experience in providing hormone replacement therapy (HRT) as a FNP at Ponce Primary Care displays a key takeaway – transgender health is not a specialty issue, but rather something to be integrated into basic primary care. 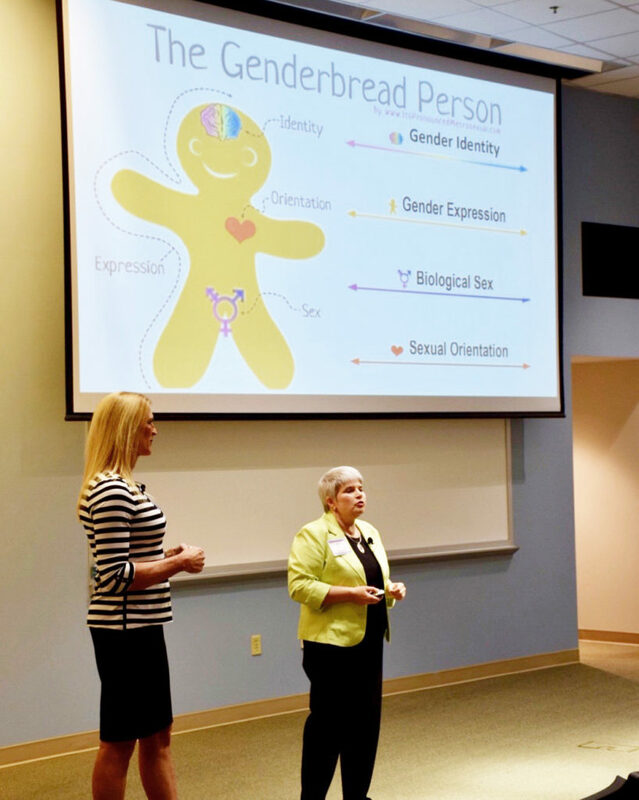 Regardless of your gender identity, this presentation had the ability to bring together healthcare providers, students, and faculty for a night of learning and growth. This is how we progress as nursing professionals and how we develop the sensitivity to communicate confidently and compassionately to our patients. Ultimately the task is on us to seek knowledge on unfamiliar topics, to lean into discomfort and to consistently evaluate our belief systems. The DESC and SpeakOUT plan to host future events that highlight the healthcare needs of racial, gender, and sexual minorities. We look forward to partnering with other student organizations and appreciate feedback on what the NHWSN community would like to learn more about. The decision to become a nurse demonstrates a commitment to lifelong learning, but must also include a keen awareness that health outcomes do not manifest equally across communities. We must strive for a more equitable healthcare model that recognizes health disparities between populations and aims to dismantle the systems that drive them. 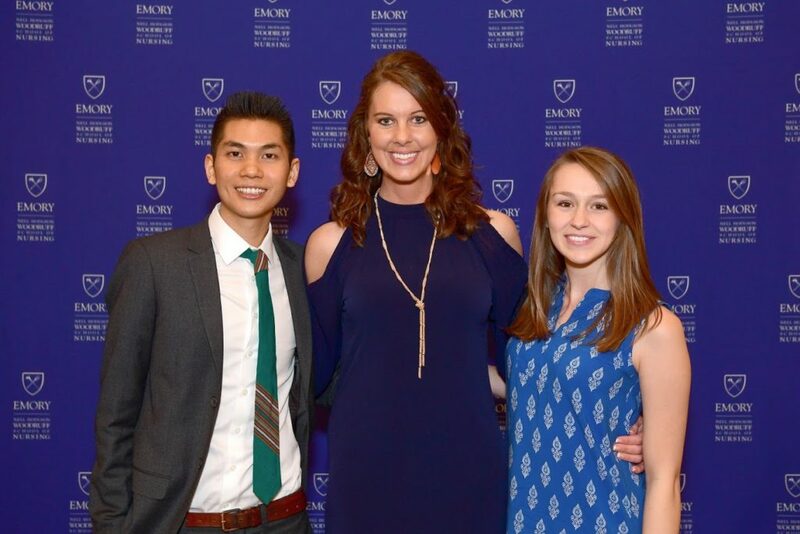 Pictured here, from left, are Mark Lee 18ABSN, Robert W. Woodruff Scholar; Lauren Verity 18AMSN, Hearst scholar; and Ann Craven 18BSN, Josephine Malone scholar. 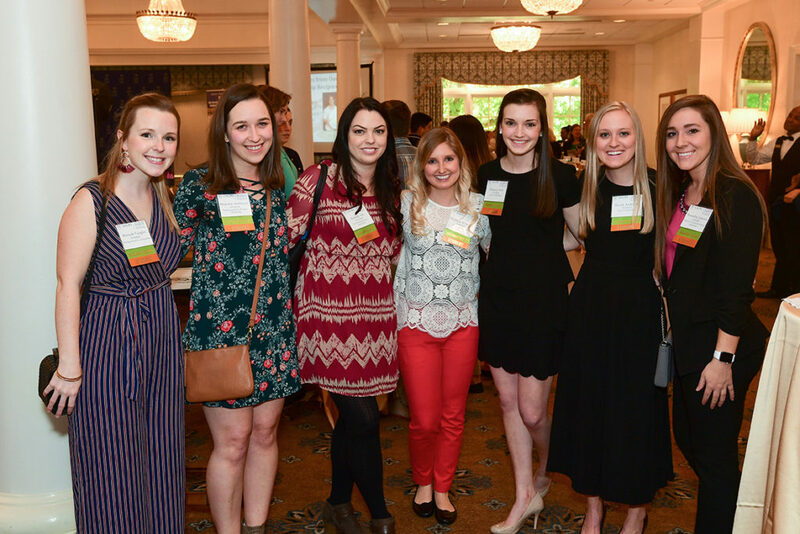 Scholarship recipients at the Nell Hodgson Woodruff School of Nursing expressed their thanks to donors who helped make their top-tier nursing education possible during a reception at the Druid Hills Golf Club. The event included more than 200 donors and student scholarship recipients. After introductory words from Amy Dorrill, associate dean of development & alumni relations and Dean Linda McCauley, several scholarship recipients told their personal stories of achievement, thanks to their individual scholarships. The Lehr family with the first Sally T. Lehr scholarship recipient, Hannah Spero 19AMSN. 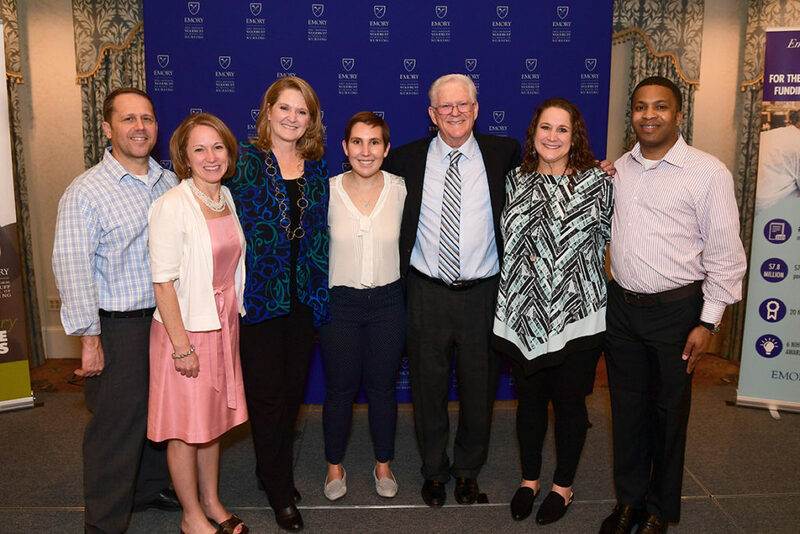 From left to right: David Ridenour, Elizabeth Lehr Ridenour, Carolyn Lehr Facteau, Hannah Spero 19AMSN, Ralph Lehr 65C 69DDS, Allison Lehr Weatherspoon, and Dustin Weatherspoon. Among the students expressing their gratitude were Ann Craven 18BSN, a Josephine Malone Scholar; Lauren Verity 18AMSN, a Hearst Scholar; and Mark Lee 18ABSN, a Robert W. Woodruff Scholar. Additional scholarship recipients unable to attend the reception because they are stationed around the world, thanked donors via video presentation. These included Brittany Eddy 09MPH 17AMSN, who is helping with healthcare recovery in the U.S. Virgin Islands following Hurricane Irma and Maria; Dria Abramson 17ABSN, who graduated in December and is working at the Children’s Hospital in Los Angeles, California; and Brandon Spratt 17BSN 19DNP, who is currently in northwest Ethiopia conducting a research project for his DNP degree. Craven, of Monroe, GA, is a true legacy nursing student. Her mother and aunts are Emory Nursing alums, and all joined her grandmother in the nursing profession. The BSN student says she always loved hearing about their nursing experiences and that each are women who lead by example, teaching her what it means to have integrity, be compassionate, selfless, and hardworking. 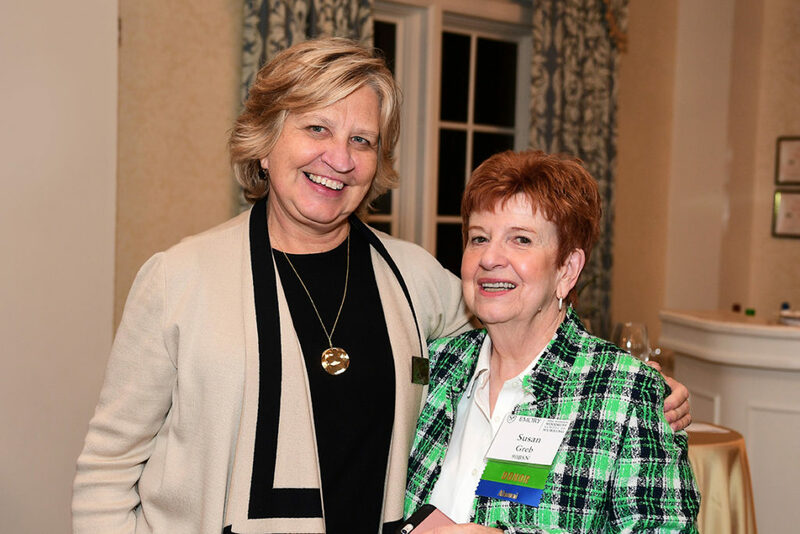 During her speech, Craven expressed appreciation to donors for giving her the opportunity to connect with her mentor, Linda Grabbe, PhD, who shares Craven’s passion for wellness interventions for nurses. 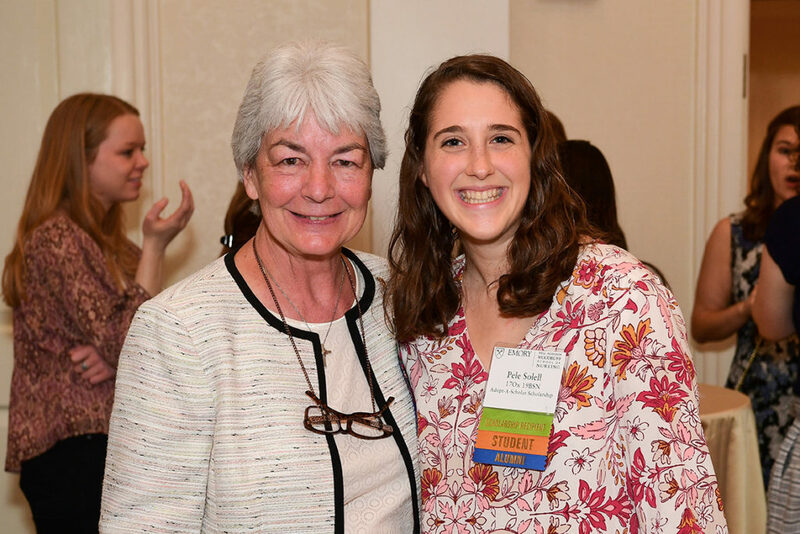 “I hope I can make as great of an impact on nursing students and nurses in the Emory Healthcare System just as they have impacted me,” said Craven. Cheryl Murphy 77BSN with her Seavey Murphy Adopt-A-Scholar, Pele Solell 17Ox 19BSN. Verity, of Marion, OH, said she pursued nursing because she has a true love and compassion for people, adding that she wants to make a difference in people’s lives by providing care and being an advocate for those in need. At a young age, Verity was led to the field of oncology. She would eventually enroll in the Emory Nursing MSN Program. Verity also thanked donors for supporting her passion for nursing. Scholarship recipients and Accelerated MSN students gather at the scholarship reception to thank donors for their scholarship support. From left to right: Hannah Vaughn 19AMSN, Nursing Associates Scholarship recipient; Madeline Steffensen 19AMSN, Harriet & Ellis Williams Scholarship recipient; Brittany Ott 19AMSN, Ellen Bowden Nursing Scholarship recipient; Madison Whitlock 19AMSN, Dean’s Scholarship recipient; Meagan Huff 19AMSN, Dean’s Scholarship recipient; Nicole Anderson 19AMSN, Dean’s Scholarship recipient; and Samantha Johnson 19AMSN, School of Nursing Endowed Scholarship recipient. Lee, of Berkley, Calif., came to Emory Nursing’s ABSN program after having earned a Master of Science degree in Global Health from Georgetown University in Washington, D.C. These courses of study comingle well with Lee’s overall philosophy on improving health worldwide because doing so requires collaboration at both the population and patient levels. He says training as a nurse affords him a great opportunity to work collaboratively across teams and settings to coordinate positive health outcomes. During the evening celebrating nursing donors and scholarship recipients, Lee said he wanted to have just as much of an impact on the future of health care as the donors sitting before him have had on him and his fellow scholarship recipients. “Thank you for supporting our dreams and our passions,” said Lee. Susan Greb 90BSN with Dean Linda McCauley 79MN. Greb is an alumna and donor who traveled from Vancouver, Washington to attend the event. Our nursing donors are alumni, faculty, staff, students, and friends of the school all with a shared mission with the School of Nursing to transform nursing, heath and systems of health care within the local and global community through education, research and clinical practice. “Donde estamos hacia dónde vamos” which is Spanish for, “where we are and where we are going.” This is the quote on the presenter slide of “ADAMES“ which was celebrating 15 years of operating as well as a despedida for Dr. Jenny Foster. This entire trip has been such a privilege and we are so fortunate to have serendipitously been able to explore Dr. Fosters last trip bringing students, and we just so happen to be a part of a luxurious and grand ceremony! It was so moving to see how the grassroots and community based program evolved over the years to tackle issues with innovative solutions such as through canguru implementation, establishing a new clinic, and most recently, hablameme bebé (a Georgia Public Health initiative)! 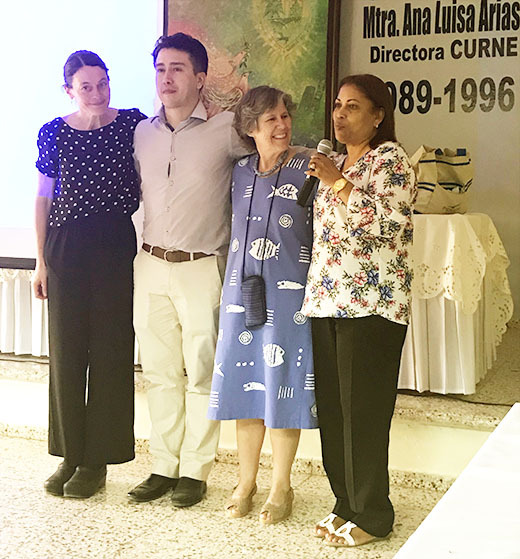 Through partnerships with the University, we were able to foster an education connection and give presentations about these initiatives as well as a pharmacology course to Dominican Republican nursing students so they can be leaders at the forefront of their communities. The dedication of multiple community health leaders to invest their own time and energy to the health of their localities highlights the community- oriented attitudes of the Dominican Republic. We also saw this first hand when we saw how remarkably innovative and comprehensive their clinic was, including: patient education in the waiting room, a colorful poster about contraceptives, a dentist office, a stocked pharmacy, a casita for residents to sleep in over nights, and an entire map of their local region with little thumbtacks for each constituent. A testament of the health and strength of the mind and body came from a 105-year-old-grandma we did a home visit too, who immediately went to the clinic after our recommendations and blessed all of us with good fortune. Through all of our various experiences throughout the week, we truly saw how far this program has come and the energy and momentum for how far it will continue to go. Donde estamos hacia dónde vamos.